Aluminium floor trays weigh 1100 gm on average, by comparison a Tillett Composite floor tray can weigh as little as 330 gm. Used by 2015 World KFJ Champion Logan Sargeant and 2015 KZ World Champion Jorrit Pex. The T11 is the seat shape most often used by the professional teams. With young drivers growing ever taller, there was a need to lower the body weight. We designed the T11 range to obtain an even lower driving position than the T5, whilst at the same time keeping an upright shoulder position, which allows a driver to retain full control of their kart without upsetting the weight distribution. The flat area on the bottom of the seat is larger than the T5 and the back angle is 58 degrees. For the 2016 season, we will be releasing a new generation of this seat. The new style T11 is the same shape as the T12 & T11, but is an improvement on both, and so supersedes both ranges. This new seat is made using a newly developed moulding technique that has allowed us to make the seat with a smooth front and back surface, and a consistent laminate thickness but unlike the T8 and T12 we also now have the ability to tune the rigidity. The "New style" T11 benefits from a specially developed high strength resin and contains a much higher fibre content that makes it more robust during drilling and impacts with the track. The rigidities available in the new style T11 are the ones mostly used in today's karts. 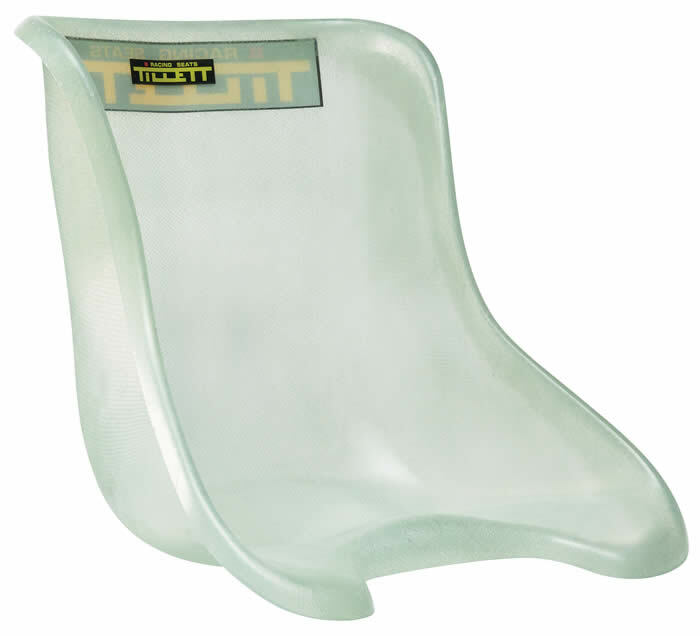 The super flexible VTi often used in the Minikarts, the flexible T11VG used in Rotax Max. Also we have the mid range rigidity, the T11t which is very popular for all classes nowadays. This "t" stiffness sits between the flexible VG and Standard T11 which is also available made by the new process. In the lightweight carbon Kevlar® versions of the T11 shape you can order the T11KP, T11KG, T11K, T11CR and T11 CXR. The T11 range now has many sizes in a "wt" wide top version, which helps fit drivers who either have narrow hips and a wide chest, or happen to use a very thick rib protector, such as our personalised composite rib protector. 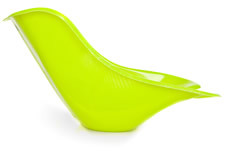 The T11 shape also has two sizes of "Wide Hip" or WH seat. These handmade seats are available in Manetti and ML sizes. They stop the hip bone from becoming so bruised that people end up cutting holes in the seat weakening the structure. The T12 is now discontinued as the New style T11 has superseded this model. 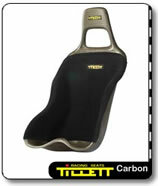 The T11 Standard and T11VG flexible versions are the most popular types of this seat. Now we have also introduced the T11VTi and the T11t material specifications. The T11VTi is made to give the most diagonal flexibility possible in the chassis. The T11t is specifically designed to fit the rigidity gap between the VG and the standard T11. The VTi and "t" specs are available in the other hand made shapes too. The T11 range now has many sizes in a "wt" version, which helps to either fit drivers who have narrow hips and a wide chest, or is useful if they should use a very thick rib protector, such as our Personalised composite rib protector. New Harvey size available for drivers falling between the S and Manetti size. Equivalent size T11 seats will be slightly larger than the T8, T10 shapes. For example; the size of a ML T11 falls in between the ML and L sizes in T8 and T10. This was the seat used by Wade Cunningham to win the 2003 World Championship at Sarno. Unlike the fully covered T5, the T5 Reverse has a smooth inside, this allows uncovered 1/4 and ½ covered seats to be produced in the popular T5 shape. The XScd T5 Rev size is popular with the 10 to 11 year old Cadet/Mini kart drivers and now there is also a new C size available for tall thin Cadets and a Ccd T5 for the shorter cadet driver who wants to use a flat bottomed seat. Because it was made off the back of the T5 moulds, equivalent size T5 Reverse seats will be slightly larger than the standard T5 moulding. For example; the size of a ML T5 Reverse falls in between the ML and L sizes in other shapes. Drivers with wide hips often prefer the T5 Reverse shape. Details on the Contact us page. T5Hand: Ccd, C*, XScd, XScd wt*, S*, Man*. MS*, ML*, L* and XL*. "cd = low back or cut down back for short drivers. "wt" = wide top, or one size bigger at the top. "WH" = wide hip, or one size bigger at the hip. "tb" = an S width with the taller height back of the MS T11. Cover colours: Fire Red, Royal Blue, Jet Black, Charcoal Grey. Covered Tillett seats can be bought without fitting kits or box, remove £2.00 from listed prices. All uncovered seats are priced without a fitting kit. 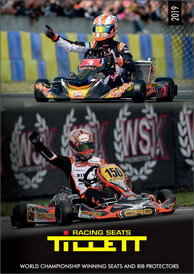 There are many factors to consider when choosing a new kart seat. If you have had a seat in the past. Do you know the size and shape? Does it still fit? If not, where are the gaps or pressure points? Will the rigidity suit your new kart/engine combination? Finally, if you are in a team will they be happy if you choose a different shape? of which are good for ultimate performance. Different shapes are fine if they are put in the chassis with the drivers back in the same place and are made with the same materials, then they will handle the same. That said, a significant angle change of the back will alter the handling, especially for bigger driver and this scenario should be viewed differently. The most common shape used now is the much copied 58Â° T11 which is by far the most popular shape. The T11 has a huge range of 22 sizes. Drivers from a 12-year-old up to a 130 kg man, are all catered for. Many of the T11 sizes solve age old problems. WT (Wide Top) sizes have been made for drivers with a slim hip and an athletic torso, (or maybe a thick rib protector). Also, available are a series of WH (Wide Hip) sizes for drivers that end up with severe bruising in this area. If you are not below 12 years old, not above 1.8 m or over 35, this T11 is the seat you will most likely use. The 63Â° T8 is very comfortable. It has leg support and deeper sides with a rounder back. We find that this deeper shape is very popular with older drivers. T9.5 The reclined 38Â° T9.5 is for the very tall drivers. This can be used to good effect, lowering the centre of gravity for drivers whose height makes the kart unstable on fast corners. This is important, as a good fit is essential for the protection of the driver and the handling of the kart. If a driver is loose in a seat he will pull to steer, pulling himself out of the kart, making it bounce at the slightest provocation. To assess whether the size of a seat that you have in your possession is correct, sit the driver in the seat and feel the gaps over the leg bone, the hip bone and down the length of the ribs, from top to bottom. This must be done with any rib protection in place, but the race suit is not so important unless it has integral padding. The rib protector when worn tight, should not move inwards as the driver sits back in the seat. Once sat back in the seat, it should be difficult to squeeze your fingers between the seat, your ribs, hip and leg bones. It's important that all the points are evenly pressured and no one element is either loose or pinching. If one area feels loose, some firm foam stuck between driver and seat is acceptable. If it is pinching anywhere you need a different size. To assess the size without having a seat in your vicinity, we find that denim jeans waist size, weight and height are good indicators. Coupled with information about the chest circumference and rib protector type. An over thick rib protector can make two sizes difference and leave you with very loose hips, so this is to be avoided (i.e. buy a P1) or accounted for with a WT wide top T11 seat. 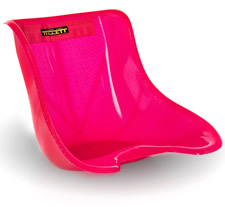 Tillett Racing Seats were the first to discover that seat stiffness affected lap times. Changing the seat rigidity alters the amount of weight transferred to the outside front tyre, it is also partly responsible for the amount the inside rear wheel can lift through the corners. This gives you the ability to balance a chassis that may not be perfectly adjusted for the track surface, driving style or weather conditions. 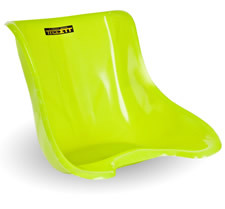 Standard OEM seats supplied with many karts are made to a price and are often inconsistent in rigidity and strength. 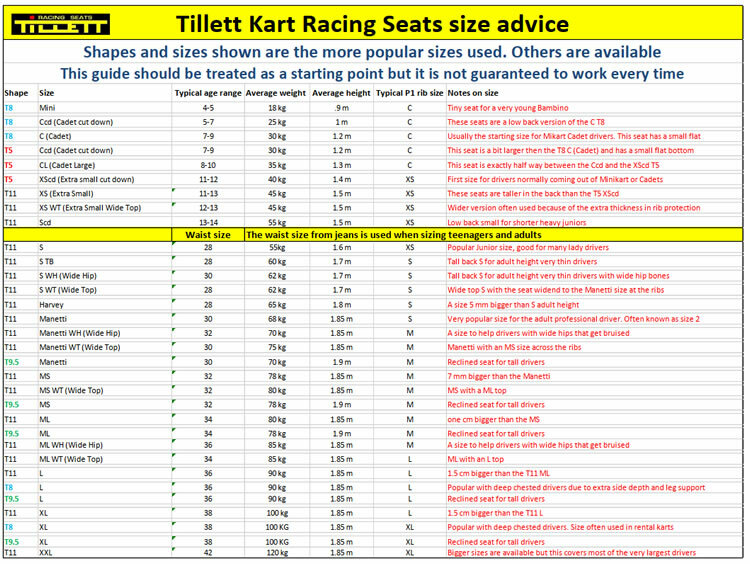 To make sure that the seat you buy this year will be the same size and rigidity as one you buy next, Tillett Racing Seats are made to set specifications. They are also unique in that they can be bought in 8 different rigidities including the hybrid VGR/VRS. The rigidities which are available in each shape are shown on the size / rigidity guide. New Style T5 and New Style T11 seats - These are made with a process that allows different rigidities to be made using a highly accurate mechanised process and the system can make seats weighing within 5g of each other. Therefore, the rigidity can be tuned to the specification equalling the tunability of the handmade seats. There are four rigidities in the "New style" specifications and all four are relevant to the rigidities commonly used by the kart chassis in use today. The New Style T5 and T11 are cut by robot to increase the accuracy of the product. The T8 - T8 seats are injected into a predetermined cavity and the edges are also cut by robot. Therefore, they are always consistent. For the T8 there are two options of flexibility, the T8 (standard) and T8 soft. Should you want more rigidity types in this shape, the T8 Hand (Handmade) version is also available to give the full range of rigidities in the T8 shape. 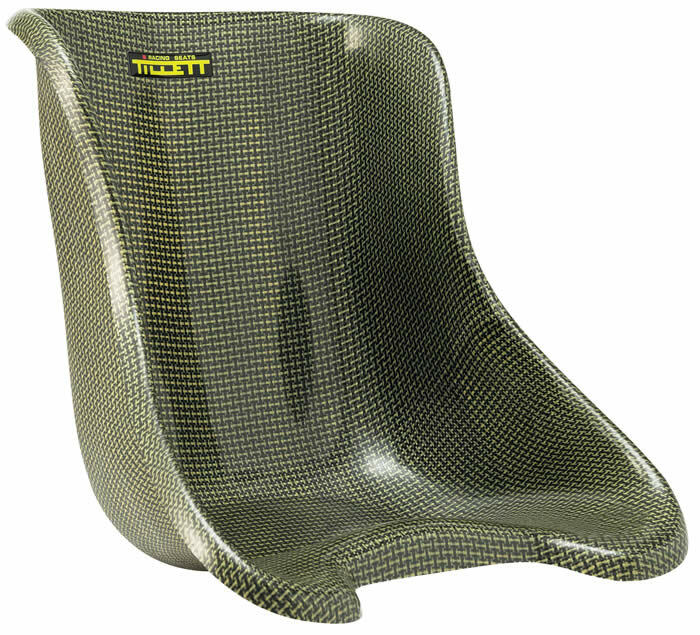 Flexible VTI, and VG - The flexible VG seats are a favourite with the Rotax Max drivers and almost always used to win the competitive Euro Max series. "V" seats are made of non-standard composite materials; they are lightweight, and we find that many people use the "VG" seat to good effect in all sorts of different classes. Using the same material specifications, there is also the ultra-flexible VTi and this is ordered by customers determined to get the most flexible seat possible. The two stroke Cadet / Minikart classes seem to prefer this specification. VG and VTi are two rigidity specifications that are available in the New Style T5 and T11 seats. The "t" â€“ The "t" rigidity is currently the most popular stiffness with OK Junior, OK Senior, X30 and KZ and sits in between the Standard and VG rigidities. The T11t spec was used in an OTK chassis to win the 2017 KFJ World Championship with Dexter Patterson and Jorrit Pex used it to win the 2018 KZ European Championship. The "t" is one of the rigidities available in the New Style T5 and T11 seats. Standard Rigidity - This is based around basic uncovered seats. The standard rigidity model of each shape only has the letter T plus its number, for example the T8. "Standard" is one of the rigidities available in the New Style T5 and T11 seats. It is also possible to make the following rigidity specifications in all the handmade seats. Rigid "R" - A thicker, stiffer version of the standard seat is shown by including the letter "R" after the T number. Extra Rigid XR - Commonly known as 'The Rope Seat' due to its filled edge. The seat has enormous strength and rigidity around the perimeter, while still allowing the front to flex a little. This extra rigid specification is designated by placing the letters XR after the T + number. They have a dramatic effect on the chassis handling. The VGR - For customers who require a rigid seat across the seat stays whilst still allowing some diagonal flex, we have the VGR. This seat has a solid rigid edge which controls the amount the seat can flex. 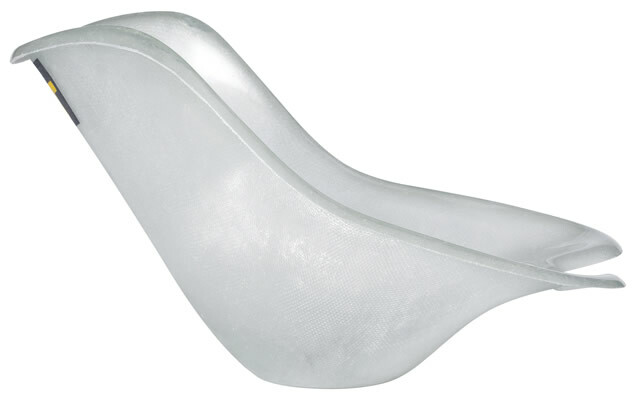 The seat is like a regular soft VG seat in the middle but is much stiffer across the top edge and down the sides. With this seat in the chassis it will reduce the inner rear wheel lift but keep a proportion of the diagonal flexibility. The VRS - This is a new version of the VGR that is soft down the centre of the entire seat with the solid rigid edge only existing along each side. This allows a seat like the T9.5 to be very reclined but still transfers weight to the front outside wheel, whilst the more flexible back edge allows more inner rear wheel lift than the VGR. This VRS reclined model seems to work well with tall drivers in cool conditions.